Let me ask you a question. Do you trust yourself? 100%? Are so well disciplined you remember everything you need to do, and do it? Are you sure, you've never blown a deadline or pushed some small task thinking „I'll do it next week.“? If you answered any of the questions with „no“ then, however good you are, you can become even better when using weekly reporting tool. Use Weekdone for your weekly planning and reporting. Not only for the office. Weekly reporting is a management technique a lot of managers use and often it's met with contempt by the employees. For it may seem like a useless time-consuming activity that takes time away from your week. In reality, when done right, it's not only useful but can benefit you both in the office and everyday life. The habit of weekly reporting. Constant reporting gives your mind a sense of stability and satisfaction. It's satisfying to mark things done at the end of the week and it's good to start your week with fresh written down goals. Don't forgot, people who write their goals down, get done a lot more. Reporting is a lot easier when automated. 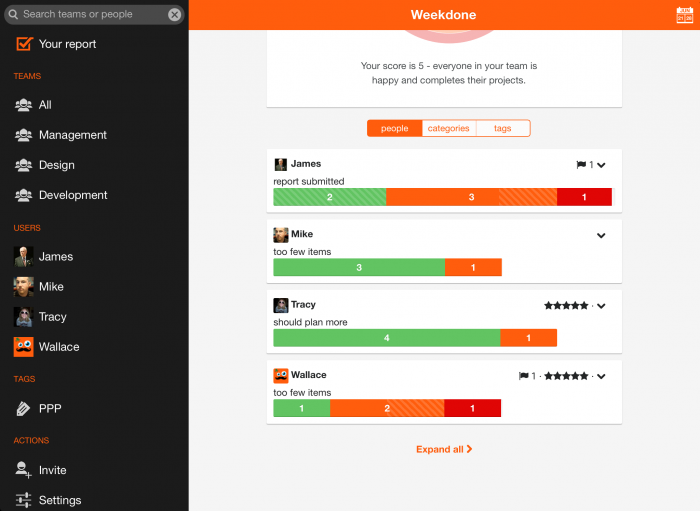 Weekdone uses PPP – Plans, Progress, Problems methodology for reporting. If you need a sample template file to download for your status report, you actually need just these 3 words: Plans, Progress and Problems. That's your sample template. Nothing more, nothing less. Add the 3 words of PPP as headings, and under each list by bullet points the items. Use whatever tool you're comfortable with: e-mail, Google Docs, Excel or a specialized nifty tool like Weekdone status reports. Benefits of reporting are many. More time: Having the reports in front of your manager and other team members eliminates all the pointless status update emails and meetings. You save a lot of time explaining what you do and can concentrate on the important part of your work. More appreciation: Reporting help you to communicate with your busy boss. You can suggest improvements and get help when you have a problem. What is more, you can get that valuable feedback and praise. To make status reporting even easier, Weekdone generates these reports automatically and let's managers view them in browser or e-mail. Remember to follow us on Twitter, Google+ and Facebook for all about PPP, status report, reporting and more!